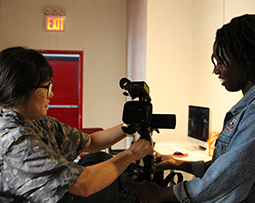 For over four decades, the PRO-TV Summer Media Fellowship has introduced young artists to collaborative filmmaking and the media arts. Over the course of just four weeks, students ages 14-21 create original works to add to their portfolio, connect with professionals in the industry, and explore the city as they produce final projects. 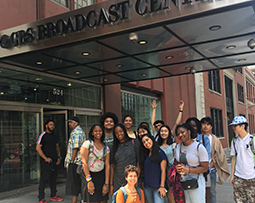 This year, DCTV has opened its doors to 50 students hailing from across the city. 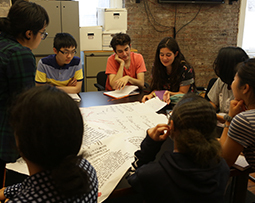 Now in their second week, students are crafting storyboards and beginning production for the concepts they pitched last week to DCTV staff and teaching artists. Topics range from mental health and the environment, to racism and immigration. Students will host a public screening of their final pieces at the program’s conclusion. Manami Tsukamoto, a rising senior at Eastchester High School found out about the program online. She's currently working in the animation group. Said Manami: "It's great how we're able to collaborate with people who have similar interests and create something tangible and interesting." She plans to spend the summer learning the basics of filmmaking, hoping to one day pursue a career in film. While most started the week diving in to projects, a dozen students headed out early this Monday for a day with CBS New York. The trip started with a tour and talkback with Managing Editor Dan Forman. DCTV’s Associate Director of Youth Programs, Sade Falebita, chaperoned the group and noted, “We had the opportunity to step into the control room minutes before going on air and watch the live broadcast of the 12:00 News in the studio with Anchor Mary Calvi and Meteorologist John Elliott.” Afterwards, students proceeded on a behind-the-scenes tour, where they were introduced to news staff and discussed the process of daily producing. They also met with Marcia Kramer, a political reporter. For most of the participants, this trip was their first glimpse into the world of broadcast. Said Imani Koroma, a rising Sophomore at Temple University majoring in Film and Media Arts: “It was so interesting to hear someone’s story about how they got to where they are, what drives them to keep working for over 20 years.” “Being in a room with a bunch of classmates who were just as passionate as me was really inspiring,” added Sarah Yearwood, soon to start her first year in undergrad at NYU’s Stern School of Business. Both are first-time PRO-TV participants. This Thursday evening, PRO-TV will also host Terri Mateer’s A Kind Shot . This one-woman show tells the story of a pro basketball player’s upbringing and journey through the world. The live performance will be filmed by PRO-TV students. The event is free and open to the public and spots are still available. See you there and stay tuned for more updates about PRO-TV’s summer!